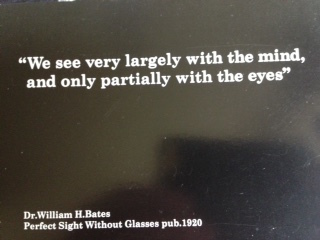 Natural Vision Education, also known as The Bates Method, has been with us for over one hundred years, starting with the work of Dr William H Bates in the United States of America. Natural Vision Education has never been as popular as it is today, with many educators around the world and an ever growing number in the United Kingdom. What is Vision Education ? Vision Education is an eyesight improvement process. A Vision Teacher guides the student in the use of activities which encourage the efficient and relaxed use of the visual system. This is done in a gentle and non-invasive way with consideration to the needs of the whole person. The emphasis is on learning to use the eyes and mind in a relaxed and natural way in everyday life while becoming ever more interested in the world around. It is actually a comprehensive method of personal development. Evidence from clients has shown that when they learn to improve the quality of their eyesight they experience a positive change in their ‘vision’ of life, with a sense of improved health and well-being that goes far beyond their eyesight enhancement. Working with a Bates teacher is a therapeutic relationship that supports the whole person. Learning to see naturally has a profound positive influence on how the individual sees and places himself in relation to his world. It is the experience and the (re)discovery not only of the clarity of the sight but of the clarity of being. Vision is a precious resource, there is an urgent need to protect it and preserve it, it is invaluable! In a world where more and more people wear corrective lenses, now more than ever it is an important priority to preserve and improve eyesight naturally. 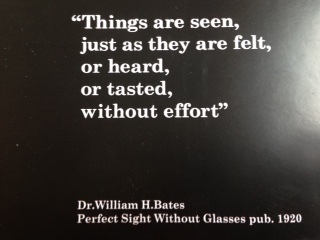 The Bates Vision Method can help people take care of and maintain their naturally good vision as a lifelong resource. For nearly a hundred years, Bates Method teachers have helped their students do this.